These two luxury travel and property companies have formed a partnership so that their respective members can use each others luxury vacation homes. The FOLIO Collection includes the Isle de France Club, a private beachfront enclave on Flamands Bay on St. Barth, with an award winning restaurant and a Molton Brown Spa. 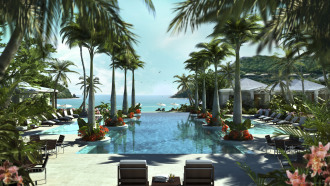 The new resort at Pond Bay, St. John, U.S.V.I, opens its doors in 2009 and will have 50 luxurious villas and cottages spread across 15 acres on a secluded bay. Ultimate Escapes is one of the worlds largest destination clubs, with three levels of homes around the world. Under this partnership, FOLIO owners can now enjoy vacations at 21Ultimate Escapes worldwide destinations, including skiing in Deer Valley, Utah, boutique shopping in Paris, exploring wine country in Tuscany, golfing in Scottsdale, or surfing in Maui. I spoke to Bill Orwig, the Director of Sales at Pond Bay. 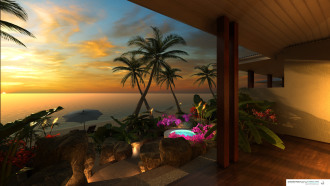 Bill explained that Pond Bay owners have four pre-planned weeks each year, and can take some of this and put it into the reciprocity program to be treated as an Ultimate Escapes members. While the owners may love their home in St John, many will still want to travel to other places and in Bills words this agreement adds huge value to an ownership at Pond Bay. The only cost to owners is a small transaction fee of a few hundred dollars for any reciprocity trip they take. Ultimate Escapes announced a similar reciprocity partnership with Capella Pedregal just a few weeks ago. The FOLIO Collection also has other reciprocity and exchange agreements in the works. Overall these work well for all sides, providing more luxury travel destinations to each of the respective members.